This week’s feature is a letter that our Director of Operations, Dexter Carmichael, received a few weeks ago from Kirsten Olson of Hunter Orchards. Hunter Orchards made only a brief appearance at the market this summer–Kirsten’s letter explains why and gives her philosophical take on crop failure. I’ve been meaning to write for a while now, but the letter that I would have sent then is definitely not the letter I am writing now. For months, John and I have been looking forward to bringing our crops to the Ferry Plaza Farmers Market and most excited about bringing our sweet cherries. The spring rains that ruined most of the California cherry crop were welcome on our trees because our fruit was not yet at the critical stage of development where rain can be devastating. As we choose to grow at high elevation in the mountain region of northernmost California, our fruit ripens later than the Sacramento Valley area and much later than the San Joaquin Valley area. This year that was to our advantage, and our trees were holding a very decent crop of Bings and Rainiers. How great to be able to offer sweet cherries at the market this year! But last week we had hail, and as a farmer, I sometimes wonder why in the world there is such a thing as hail. What good does it do? In less than five minutes, hail can destroy an entire crop. Then I remember the time BF (before farming), when the wonder and fascination of hail was simply a delight, and trying to catch hailstones in a saucepan became a hilarious challenge. Now the challenge during a hailstorm is trying to remember that there is much more non-cherry space in the cherry trees than there is cherry space, like the way an atom is more space than substance. And it must be true because the hail came and went and left the cherries almost unharmed. Blessings abound! One of my preferred jobs on the farm is taste testing, and it is just as good as it sounds. The Bing cherries are wonderful to test because they are sweet when they are red and they just keep getting sweeter and sweeter until they are that beautiful mahogany-black color, and the skin is so taut that you can see your reflection in the mirror-like surface. This process can take a week or ten days or more. A few days ago, I was in the cherries and discovered that I was not the only one enjoying the fruit. In addition to a few persistent house finches that always find their way under the netting that covers our trees, and in addition to the wasps and yellow jackets that clean up the fruit that the birds peck, somebody else was enjoying the incredible sweetness of cherries. The fruit was not quite ripe but it was already beginning to fade, the skin seemed to be getting looser instead of tighter, some of the fruit had a definite damaged look, and there were tiny holes in the fruit. This was something new in the orchard; in 18 years of growing cherries here in Siskiyou County we had never encountered this. Research in our extensive orchard library was no help. Once I got on the web, it didn’t take long to discover that the damage was being done by the cherry fruit fly. As it turns out, the female cherry fruit fly can lay about 350 eggs in her short life of a few weeks. There must have been a gaggle of fertile female fruit flies in our orchard because our crop was ruined. Even the fruit that looked undamaged had been “stung”. The crop could not be salvaged. However, we still needed to pick all of the cherries and destroy the fruit (a clean culture practice) so that we eliminate as many baby fruit flies as possible and ease the pressure on next year’s crop. One of the amazing things about the growth of organic agriculture is the attention now being given to discovering and developing materials to aid the organic growers in protecting their plants. Organic growers now have products available for the effective control of cherry fruit fly, where only a few years ago the choices were not very many and not very good. Everyone who supports organic agriculture, everyone who buys organic products, has helped to create this change. Consumers may be unaware of their incredible power when they purchase organic produce. The consumer is saying, “I want organic.” And the agricultural community is listening. The researchers, educators, scientists, and product developers are responding and providing answers to organic farming problems. And John and I are grateful. Even though it is too late to save our crop for this year, we are able to be hopeful about next year’s crop. Farmers…ever hopeful. We tried to bring cherries to market, but we had a crop failure. The success of a crop failure lies in the lessons learned. Our lesson of the cherry fruit fly invasion has been severe; the learning has been hard earned and I doubt if it is over. With farming, it seems that the learning is never over. We are growing right along with the crops. 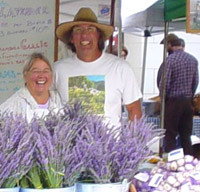 We tried to bring cherries to market, but we will be bringing buckets of lavender instead (editor’s note: Hunter Orchards brought their wonderful garlic, peach preserves and lavender to the market the past two weeks, but will not return until next year). Thanks for being a good ear.